After returning home from six splendid years travelling overseas, our Perth tour guide and Director of Merriment, Monique Boucher, was keen to explore her hometown of Perth with fresh eyes. The bourgeoning new bar and foodie scene was beginning to explode in 2013 and she was keen to experience everything, all at once, on a bus tour. 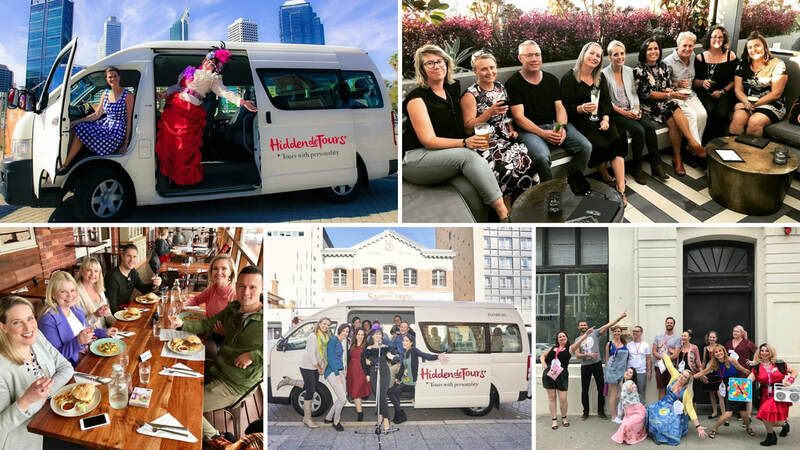 A year involving numerous trial bus tours across Perth, Fremantle and surrounds with very eager friends, to bars, cafes, restaurants, wineries, cideries, breweries and more, ensued, all in the name of research. In January 2014 with the official launch at Fringe World Festival, Hidden deTours was no longer a hidden secret. With a suite of hidden bar tours, wine tours and a comedy history tour starring Famous Sharron, the word was out and Hidden deTours had hit the streets of Perth! Four years on, with two Fringe World Festival award nominations, ample sold out shows and tours, television and radio appearances, media reviews and many a happy customer, we are set to release exciting new tours. We revel in creating incredible group experiences. And have some exciting news to share - announcing our new public tours on sale for March 2019. You can now buy by the seat. Hooray!